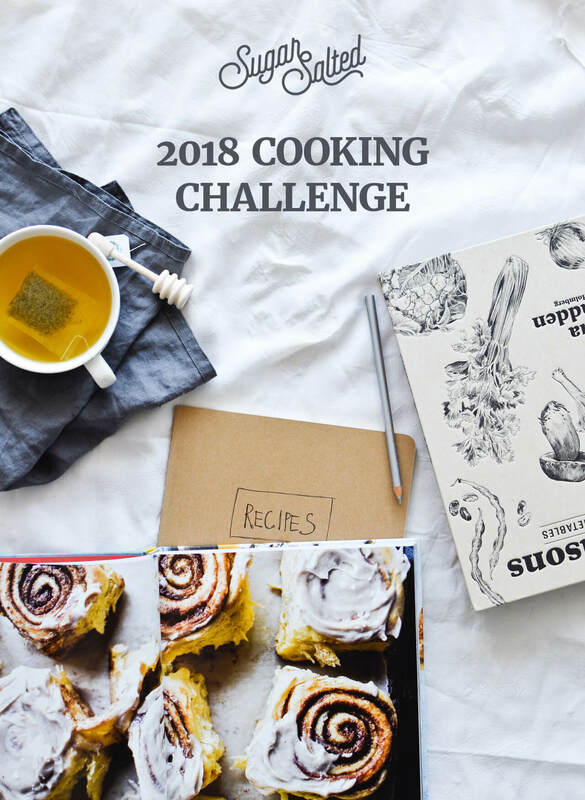 Welcome to my Sugar Salted challenge for 2018! You must be wondering why I’m sharing this on February 1st, when most challenges start with January. Well, let me tell you why. The reason why I don’t usually “start” things on January 1st is that I’m just not ready. I’m still in recovery mode in the beginning of January, just floating in a post-holiday daze. There’s always wrapping paper sitting in the corner of my home office, the Christmas tree still standing proud, I always have a leftover stack of birthday and Christmas chocolates on the counter and cards on the table. I’m still in festive mood, to be honest. So starting anything in that first week of January seems overwhelming. February is just better. I’m more awake now, more prepared. 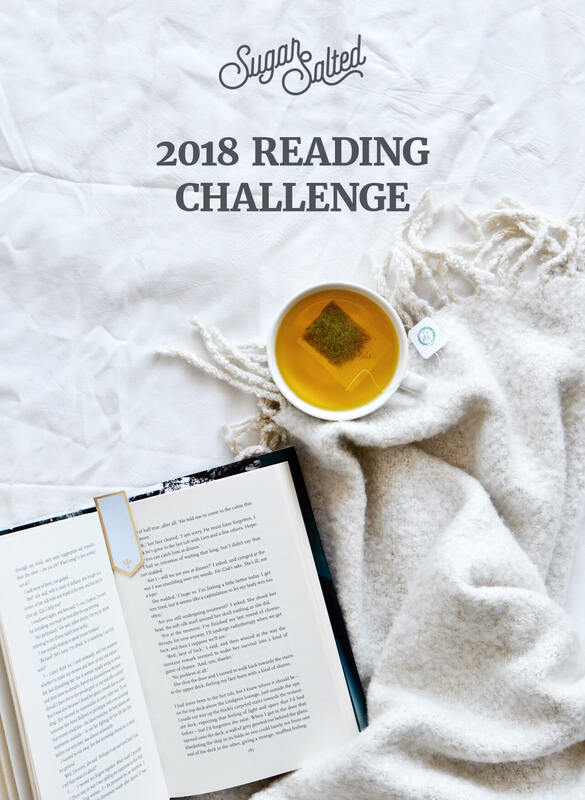 As you can see this is a yearly challenge and it comes with 5 objectives – nourish, breathe, learn, enjoy, read. 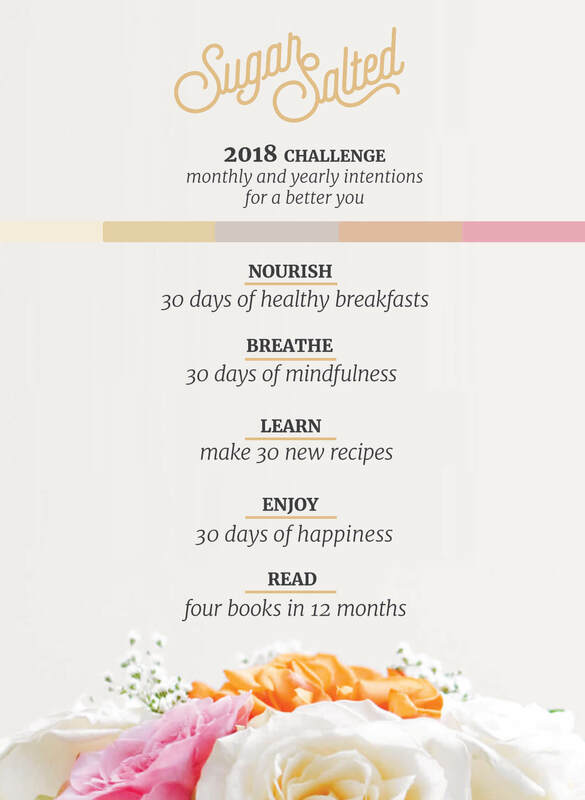 Three of these are 30-day challenges which you can start on ANY DAY (and repeat throughout the year if you wish), and two objectives are yearly, meaning that they span out over the course of the whole year. If you’re super human you could do them in 30 days too, but I’m just a regular human so I’m taking my time. My main goal for 2018 is to grow. Learn new things, hone my skills, practice self care and love. Be better and do more, but do it at my own pace. That’s why I picked 5 goals. You’re probably wondering how exactly all of this is supposed to work. You have three 30-day challenges and two yearly ones. How to organize it all? Well, I made you a calendar, of course! One is blank, so you can make your own game plan. The other one is filled in, so you can see how I’m doing it. You’ll see that the challenges are nicely stretched out, so success is pretty much guaranteed, you just have to want to do it. You can print out the pre-filled yearly calendar here. And if you want a blank one click here. How to start and participate? As seen in my yearly plan, I’m starting with goal #1. You can follow along or change things according to your preferences. But to make things easier for all of us, I made individual printables as well! They’re all simple black & white, so taking notes and keeping track of your progress is super easy. 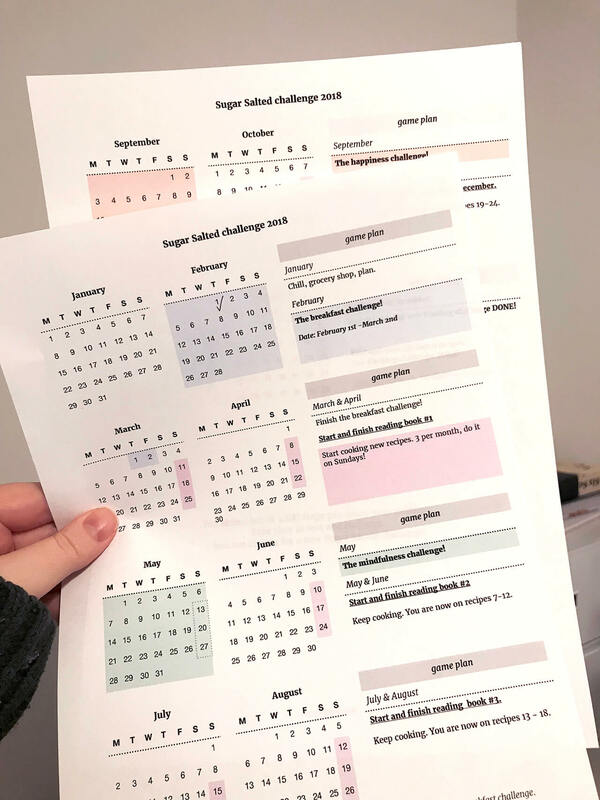 You can just print these out and start the challenge! I’ll be posting updates here on the blog and you are welcome to share your progress here. I’ll also be posting on my Instagram and I’d love it if you’d join me! Tag me and use the tag #sugarsaltedchallenge so I can find you. Bellow is a breakdown of all the goals, as well as the printables that go with each of the goals. 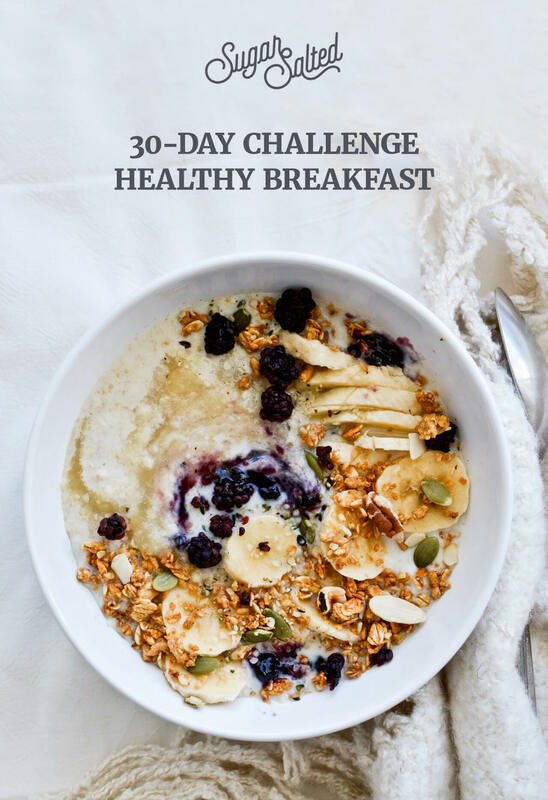 Objective: nourish your body by eating a healthy breakfast every day for 30 days! Aim to eat within 2 hours of waking up. Always have water (or tea) on the side. Sometimes I wake up and am in “go go go” mode from the start, so having a good breakfast every day can be challenging. I want to be more responsible and really make sure I have a good start on a daily basis. I know “healthy” can be a bit subjective, but my main goal is to always include fruit and/or vegetables, along with good grains, protein and little to no sugar. I am a repeat offender, meaning I can easily eat the same thing all week long. But for the sake of this challenge I’ll try to come up with more ideas for you guys. Pictured here is what I’ve been enjoying in January: oatmeal with applesauce, chopped banana, sprinkle of granola and hemp hearts, small dollop of blueberry preserves and dried berries. I love a late brunch on the weekends, so to combat that I think I’ll always try to have a smoothie first in the morning and then have a second breakfast aka brunch later on. Objective: be present in the moment and breathe. I want to make a practice of writing down my thoughts more often, and this mindfulness exercise (challenge) is the perfect intro to that I think. The end-goal for me is to have a more positive mindset and to really enjoy some quiet time everyday. It’s so easy for me to just do something all the time, so hopefully this challenge forces me to just STOP and really be present in the moment. Objective: make 30 new-to-you recipes in 2018! That’s 3 per month if you start in March. That’s pretty straightforward, right? This challenge is about honing your cooking skills. If you’re here on my blog than that already means you’re interested in cooking and you know I am too, clearly. The reason why I am doing this challenge is that I am usually so caught up in my own recipes that I don’t try new ones enough. A new-to-you recipe can be anything from my blog, from other blogs, cookbooks, magazines, etc. I am adjusting the rules for myself though. I want to cook 30 new recipes, 10 of these being main dishes, that have nothing to do with recipe testing for the blog. Any new recipes that I try out or create for the blog do not count. So, my goal is to cook “just because” and I have to find 30 new recipes for that. I already have some on my wish list and I will share the list with you soon, as well as pictures throughout the year! 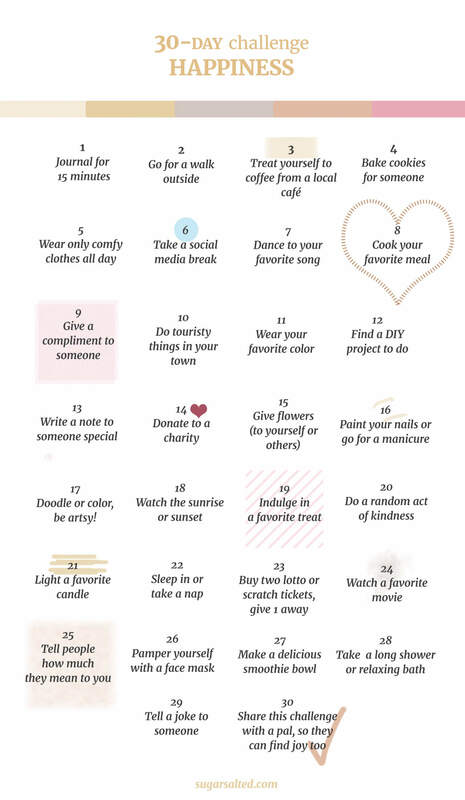 Objective: spend 30 days doing joyful things for others and yourself and finish the month a happier person! I just love this challenge. You’ve probably seen similar ones making the rounds on the internet and I’ve always been a fan. I’ve just never participated in one until now! 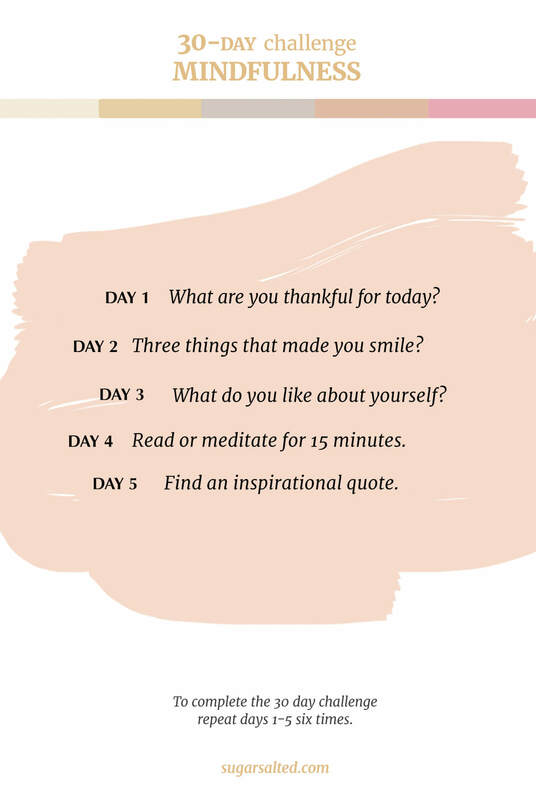 Because of how fast-paced our lives are, I think we sometimes forget about the little things that could make us and others happier, so this challenge will really make you focus on that. If doing everything in 30 days seems too much, take more time! You can stretch this out if you want or repeat it. Objective: read at least 4 books. That means one every 3 months, which I think is very doable. Once you get through those 4, feel free to add more! This could possibly be the best challenge of all, although I think all 5 goals are totally doable and awesome. But this year I want to read more! I have some books left from last year that I need to finish, but I also got a few new ones and I will be updating you with a list. We can also turn this into a mini book club! This is it! What do you think? If you are joining me, tell me about it! Tag me on Instagram. I want to know what you’re eating and cooking and reading. I want to know everything! You can expect monthly updates as I move through my goals, so check back to see how I’m doing.